Cotton Babies, Inc, maker of the best-selling bumGenius® cloth diaper line, has recently introduced Elemental Joy, cloth diapers carefully engineered to be affordable, adorable, and completely reusable. Parents no longer have to waste their time searching for the best deals on disposable diapers. With Elemental Joy, parents can purchase all the diapers they need for their baby for just $115. Priced at $28.75 for a set of 6, Elemental Joy is available in vibrant colors and fun prints. That’s a fraction of the cost of disposables! Just 24 diapers will diaper most babies from just after birth through the potty training stage. “Diapers are expensive. Many families struggle to feed their family and buy diapers. If a family wants to use cloth diapers, cost shouldn’t be their obstacle,” said Jennifer Labit, founder and CEO of Cotton Babies. Diapering a baby consumes a significant percentage of a family’s budget, and while there are government programs to help families purchase groceries, no resources exist for diapers. As someone who faced the challenges of diaper needs as a new mom, Labit understands the need for an affordable solution to diapering babies. “Worrying about how you will pay for more diapers or where you can get them puts a significant amount of stress on caregivers. Elemental Joy provides an alternative to help put an end to the cycle of diaper need and empower parents,” said Labit. Elemental Joy diapers are being manufactured in St. Louis, Missouri as part of a project Labit began in 2016. The project has created a number of new jobs for local workers. 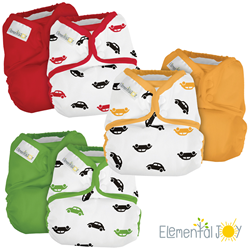 Check out Elemental Joy cloth diapers in cheery colors and playful prints at a price that can be beat at ElementalJoy.com. Calling Fenton, MO home, Cotton Babies is a privately held market leader in the juvenile product industry and a diverse retailer, offering cloth diapers and a wealth of other products designed to make parenting easy. Cotton Babies is a socially active organization supporting outreach and diaper grant programs for financially underprivileged families. CEO Jennifer Labit is a founding chair of the Real Diaper Industry. Cotton Babies products are sold on CottonBabies.com and through independent juvenile products stores and major retailers. Cotton Babies diaper brands include bumGenius™, Flip™, Econobum™, and Elemental Joy™. Find Cotton Babies on Facebook, Instagram, Pinterest, and the OEKO-TEX® Buying Guide.